DCR Guest Studio's: New guests! We have three new guest! Michelle Duncan is a writer and academic from Boston, US. She's been here for two weeks already, working on a book as well as new essays. Feminism, sirens, opera and activism are all linked together in her writings. Bahanur Nasya and Yilmaz Vurucu are a couple-in-residence. Born in Austria and Canada but both from Turkish origin, they have a interesting view on the eastern-western dilemma. At this moment they're making the final edit of their new movie 'The Sea in me, which they made for 'Now Wakes The Sea' in collaboration with Satellietgroup. 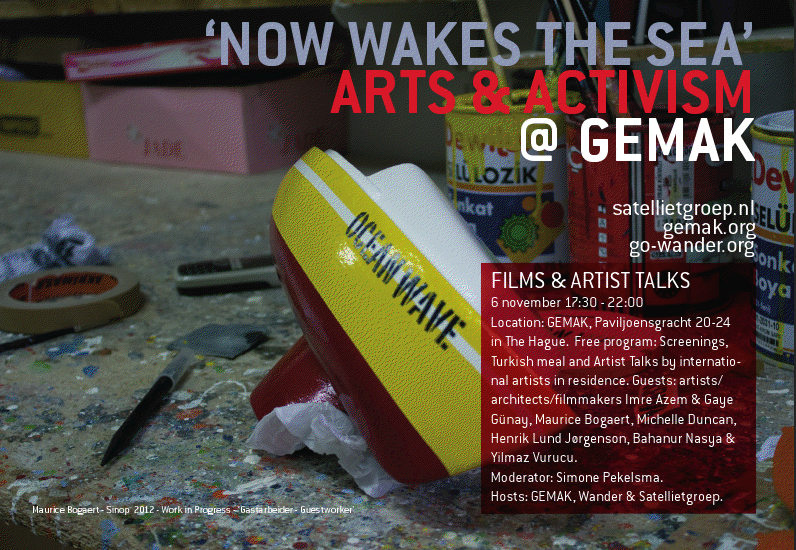 On the 6th of November we'll host an evening in GEMAK with artist-talks, video-screenings and a Turkish meal with our guests, as well as Imre Azem, Gaye Gunay, Maurice Bogeart and Henrik Lund Jorgenson. The focus of the evening is avtism in art. See flyer below.